Palm Sunday 2015 is this weekend. We will have worship on both Saturday night at 6 p.m. and Sunday morning at 9:00 a.m. Plan your weekend around making sure you are at worship this week for the beginning of Holy Week. *Remember the Triumphal Entry of Jesus into Jerusalem. We will wave palm branches as they did nearly 2000 years ago. We will give thanks to God for the fulfillment of his prophecy about the coming Messiah and eternal King of Israel. *We will begin our Holy Week observance. Click here for the full schedule. 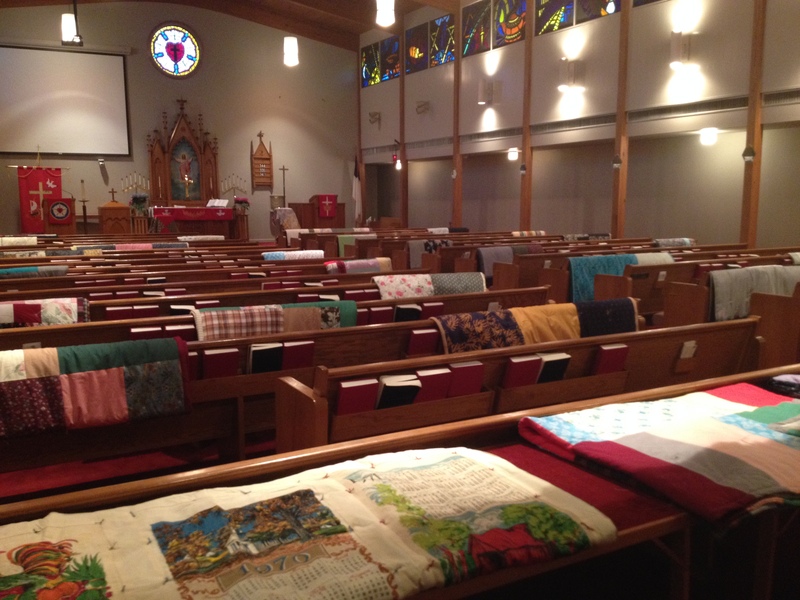 *We will dedicate the Lutheran World Relief quilts and kits. See the photo above for an image of what we did last year at this time. You are invited to make this the beginning of a very special week as we relive and experience the joys and sorrows of this most important week in human history.